Swanneck Ltd will be exhibiting at the Stationery show London business centre in April 23-24 2013. in Stationery week. They will be exhibiting their innovating Swanneck Pen range on stand C830. 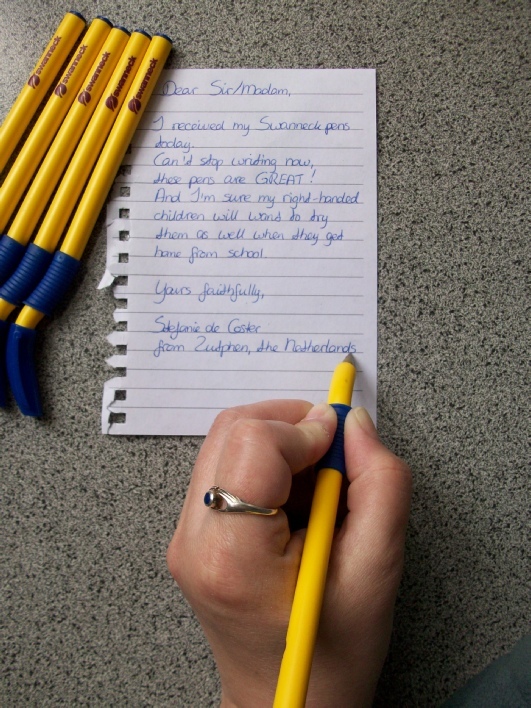 Swanneck Pens are available in bright and fun colours and finishes. Launching at the Stationery Show 2013, Swanneck Pens with Biomaster Antimicrobial Technology for Educational and Healthcare Sector. Many children learning to write find themselves embarrassed and discouraged - just at a time when they need all the confidence they can get. Writers often find themselves forced to tilt the paper at all kinds of awkward angles - contributing to illegible 'sloping' styles, calluses, even muscular pain. The “Swanneck” pen is the logical writing solution. The” Swanneck” Pens represent a revolution in ballpoint pen design that's not only ergonomic, it looks great too. Extensive trials show that our easy-to-hold “Swanneck” pen “profile generates nothing but a positive response, both from children and older writers who've long been frustrated by conventional standard pens. Patented and design registered community design 00835996-001, USA design reg no D603896, UAE 225/2008 SAUDI ARABIA design no 995 app no 408290135 world patent and design application applied. “Swanneck” is a trademark of Swanneck Ltd.
Swanneck Ltd is a London Based company with offices in the Middle East. We have designed an innovating Stationery Product for the 21st Century ideal for children when learning to write at school and elegant and ergonomic for our adult writers.